Audials One is the leading legal recorder for high-quality recordings of video streams and audio streams such as movies, video clips, series, music, audiobooks etc. The new generation 2019 of the world-renowned and highly-acclaimed portfolio of Windows software has been recently released. New features such as the Music Bot, Music Styles and improvements such for recording Spotify, Amazon, Netflix and many more in better quality enable users to collect music, movies and series easier, faster and still in the highest quality. Audials software has been optimized for Windows 10, 8, 7 and is available as an app for smartphones and tablets running Android, iOS and Windows. Recorder, converter and manager for music, videos, series, movies, podcasts. Only software for automatically batch recording movies and series. Music discovery in a universe of artists sorted according to genres with Music Zoom. Enjoy all recorded media files on PC, smartphone or tablet anytime. The software might seem overwhelming for beginners. Audials One is the complete package for music and film lovers. It enables you to establish your own music collections legally and free of charge. Music can be either recorded from music streaming services such as Spotify, Deezer, Apple Music and so forth, music portals such as YouTube, SoundCloud, DailyMotion, Vimeo and others and also over 100,000 online radio stations. Record all music you want to hear – in the best quality with automatic addition of ID3 tags, album cover and lyrics. On top, you can use Audials in combination with your subscription to video streaming services and record movies and series in the easiest way thanks to preconfigured tiles for all top services. The new generation also includes, Music Styles, a unique way to get music recommendations for every mood or taste. 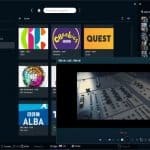 When selecting a few sample artists or radio stations, the software will give you an incredible number of artists, tracks, playlists or compilations according to your taste. As an additional service, the Audials team delivers every week the current music charts for pop, rock, dance, 80s, singles or music videos as well as movie soundtracks, independent hits, playlists according to the mood etc. to always supply you with the best music tracks. 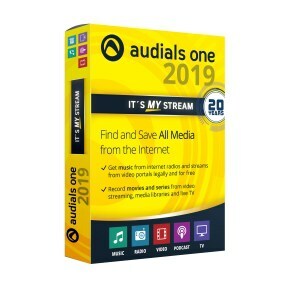 Audials One 2019 not only saves all contents from streaming services with the batch recorder or automatic series recorder, for enjoying your favorite movies and series on smartphones or tablets and without Internet connection but offers you over 300 TV livestreams on top. You can watch all highlights from TV channels around the world full-screen and record the best programs with a single click. What is better in Audials 2019? Audials 2019 provides you with music and videos faster, easier and in better quality. Moreover, plenty of new music features as well as new preconfigured streaming services for easy recording by suggestion of the best method are available to you with Audials One 2019. The new generation 2019, make Audials One more powerful than ever before. 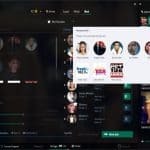 Entry-level products exist as well: Audials Moviebox is the expert for video-streaming, Audials Music Rocket supplies you with all music you desire, Audials Tunebite Premium is the audio-streaming recorder and Audials Radiotracker includes more than 100,000 online radios to record music in MP3. Does anyone know if this software is the finished article or do you have to pay for add-ons? I get the feeling that Audials One 2018 is a base product that needs you to purchase other software modules so as to operate successfully in any meaningful way..